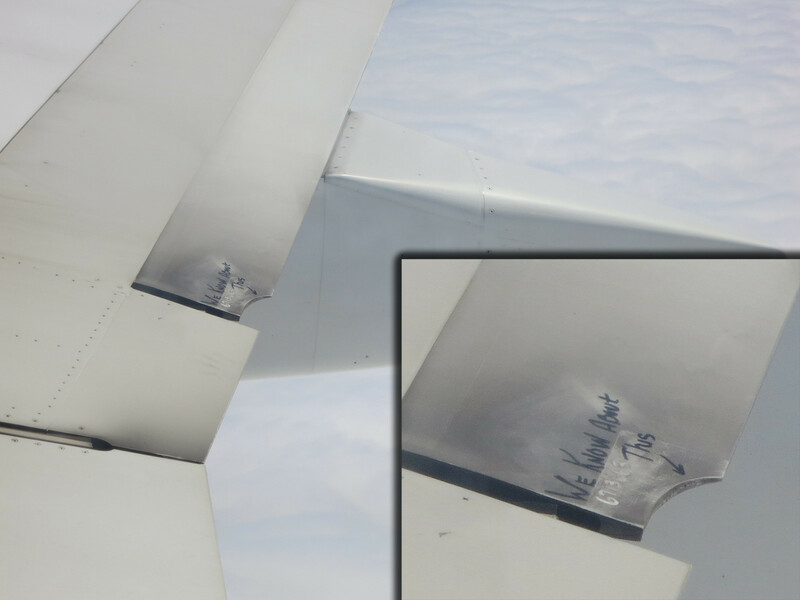 Last Saturday, the 28th of July 2012, as Alaska Airlines‘ Boeing 737-790 N611AS flew along passengers noticed some writing in black magic marker on the aircraft’s starboard side, with an arrow pointing to a cut out in the flap. While the crescent shaped cut out on the 737’s outboard flap has clearly been machine cut and smoothed, an arrow pointing to the cut out is accompanied by “We Know About This” in large black marker. Understandably, passengers may be alarmed by seeing any damage on their aircraft, no matter how minor, and they likely may not have noticed it had the cut out not been marked. To minimize the viral nature of the photo depicting the note on the wing, Alaska Airlines tweeted “The way this was communicated on the plane wasn’t appropriate. Our apologies for any alarm it may have caused,” however the message on the wing clearly was not for passengers. Airlines often leave notes in magic marker, or on tape, or place tape over areas that need mechanical attention (there is specific tapes approved for internal use and external use). These notes and tape-overs aren’t for passengers, but rather for ground crews and mechanics. If you walk around enough planes you’ll find random things written in random places … not on all planes … but you’ll spot these telltale signs of a non-functioning galley outlet, a sticky lavatory door lock, and a broken seat tray table. Granted, Alaska Airlines ground staff could have left their note on the underside of the flap … but if nothing else, it is sure was polite of the ground staff to let the passengers know that they were aware of the cut out in the flap … while also saving the ground staff at each station from documenting the cut in the flap, which is apparently an approved deferred mechanical repair. Below is a photo, from Reddit, of what passengers on board Alaska Airlines’ aircraft N611AS saw as they looked out their window. I suppose the Post-It notes kept blowing off. I have to wonder what I would do if I saw that. I think I would have asked a crew member something to the effect of “what’s that about?” and let it be after that. Would it have been better if it were on the underside? I doubt it. The cut would still be there, and without a message indicating that it’s a known condition/issue, it may be more of a concern. As an aircraft mechanic, I think the flap should have been repaired back to its original design specifications. If you are going to all the trouble and time to machine cut a portion out why not fix it to original specifications Although its an approved deferral method – it still looks tacky – a flight control with a hunk removed and a hand written note ………really?? ?